I am Autistic. Hear me. I am an Autistic Woman. I do NOT need to be cured. I do not need to be eradicated. I am not in crisis. I am not represented by a puzzle piece or the colour blue. I say NO to Autism Speaks and you should, too. Want more information? 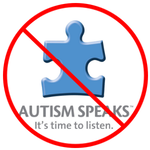 It’s as simple as googling BOYCOTT AUTISM SPEAKS.